Youth homelessness continues to be a seemingly intractable problem in Canada. We believe there are solutions, and that means leveraging the best knowledge we have to do things differently. Without a Home demonstrates that with respect to youth homelessness, we are waiting much too long to intervene. In many jurisdictions, services for young people who experience homelessness are not available until they are 16 or even 18. The evidence presented here suggests that by that time, a lot of damage has already occurred. In this report, we outline the need for a prevention-focused approach that prioritizes systems integration and Housing First for Youth (HF4Y). Our current systems tend to focus on the provision of supports downstream, when young people are much older. Rather than focusing on preventing the problem or reducing the negative outcomes of youth homelessness, we are more likely to wait for a major rupture or crisis, or when the problems facing the youth become much more acute. This report vividly demonstrates the suffering caused by this approach: housing precarity, violence, marginalization, health challenges, and social exclusion. By failing to implement more effective strategies to address youth homelessness, we are undermining the human rights of these youth. If we really want better outcomes for young people, we must do better. 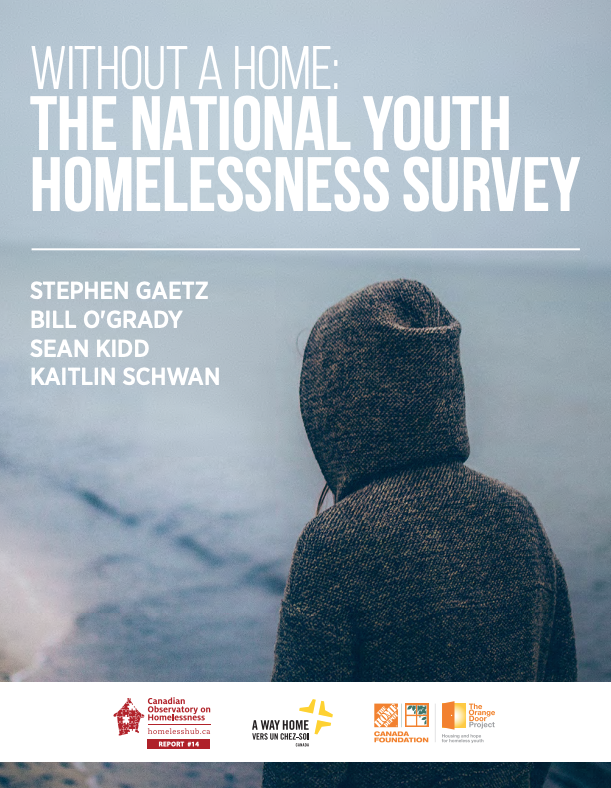 This survey provides policy makers, service providers, researchers, and the general public with some important baseline information about youth homelessness in Canada. The challenge we face now is mobilizing this knowledge to ensure that each and every young person has access to housing, safety, education, and supports. Funding for this study was provided by the Home Depot Canada Foundation.